Review: Unwholly by Neal Shusterman - Book.Blog.Bake. I named Unwind one of my favorite books of 2012, so I think it would make sense that I eventually followed up with the sequel, Unwholly. Normally, I don’t worry that sequels will live up to my expectations because I have a habit of trusting authors(sometimes overly so), but Unwind was just so good that it took me a week before I felt ready to move on to Unwholly. One of the things I loved about Unwind was that the ending was so satisfying. Not everything was wrapped up in a neat little bow, but the world would have been just fine without a sequel, which made me hesistant to pick this book up. However, I’m too curious not to read such a book. For the most part, Unwholly lived up to my expectations. Lev is still one of the most interesting literary characters I’ve ever read, so complex with motives and truly three dimensional. More back story on the Heartland War and how the Unwind amendment could be approved so quickly. The same emotional complexity that was found in Unwind. The “bigger picture” this book takes with science and corporations. I think adding in this corporate element made the world of Unwholly more believable. The plot lines(yes, the multiple ones). As frustrating as it can be at times to juggle so many stories and characters, I appreciate how complex the situations presented in this book are. That’s how real life normally works too–not just a linear cause and effect but several factors normally go in to causing something. High stakes. The stakes in Unwind were personally high for the characters I came to cherish, but in Unwholly, we get to see just how many lives are in danger. Most of the new characters. As much as I loved Risa, Connor, and Lev, I’m once again reminded that there are other desperate people in the world of Unwind. The addition of a character made completely out of Unwinds. Horrifying, creepy, and raises interesting questions. The character of Starkey. Shusterman is so good at making all his characters believable, but I just could not follow Starkey’s one-track motive. He never questions or doubts his decisions, and I find this hard to swallow from an author who at times made Roland more than just a stand-in villain and let you inside the minds of people who really thought they what they were doing was for the best. While I loved the changing points of view in the first book, every once in a while a view seemed out of place in this book. Not enough to make me frustrated, but it did distract from the story some. Final Impression: It would be hard for Unwholly to live up to my standard that was set by Unwind, but it does not disappoint. It’s not the near-perfect work I consider Unwind to be, but it’s very, very close, and more than a worthwhile read. 4/5 stars. You can find Unwholly on Amazon. can you read unwholly without reading unwind? Unwind was good, but UnWholly was just so much better! I loved the fact that Shusterman introduced new characters instead of confining the story to the point of view of the old ones. I have just finished reading Unwholly, and I suffered it a lot. I know it is all fictional yet I found myself slamming the book across my room when for example the nurse told Risa the other kids that were supposed to have died, were actually send to harvest camps. 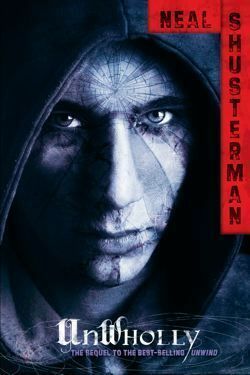 I can´t stand the cruelty of humanity that Shusterman portrays, it disgust me utterly and completely and all the anger I felt was pointless because it´s all fiction. That´s why I find the book so great, it makes me go crazy in so many ways and the power of words really gets to me. I think your review was great, I didn´t notice the flaws in Starkey´s character because I was to blinded by anger towards him. And I am like one of those kids that worshiped Lev, I think you are completely right about his complexity, he is much more than a clapper, or an AWOL, or a tithe. I think he is too young (as well as the other characters) to do such cunning and great things, to speak with such wisdom. I never heard a more interesting conversation than the one he had with Miracolina the second time they had a “meeting”. Another character that owes my love is Hayden, from the moment he was put in that container with Connor and the two other kids where they discuss death and unwinding, he amazed me, not for being wise, but with his open-minded personality and his curiosity. His death in this book broke my heart as much as Cy-Fi did in Unwind. Top Ten Tuesday: Most Frustrating Characters Ever. | Book.Blog.Bake. I love both Unwind and Unwholly. It’s like I live them, and they terrify me. Have you heard about a movie version? I read on line that FOX is making the movies. If so, I really hope they use the same cast that they did in the video on youtube for Unwholly. They were really good. I almost couldn’t sleep after watching Nelson. And, Conner was good too…. so were Risa and Lev. Nelson was exactly how I always imagined him though. I’ve heard about the movie version–I feel like it’s going to be one of those things that is REALLY good or REALLY bad. I think the story line itself will make a good movie, but it will really depend on the actors and script. Very well done review! I haven’t read Unwind yet, but am really looking forward to reading them both now! Love it when a book moves you so much that you have to digest it before you can move on to another read. Can’t wait! Thanks for stopping by! I hope you like Unwind whenever you get to read it. It’s pretty compelling, even when it is creepy.